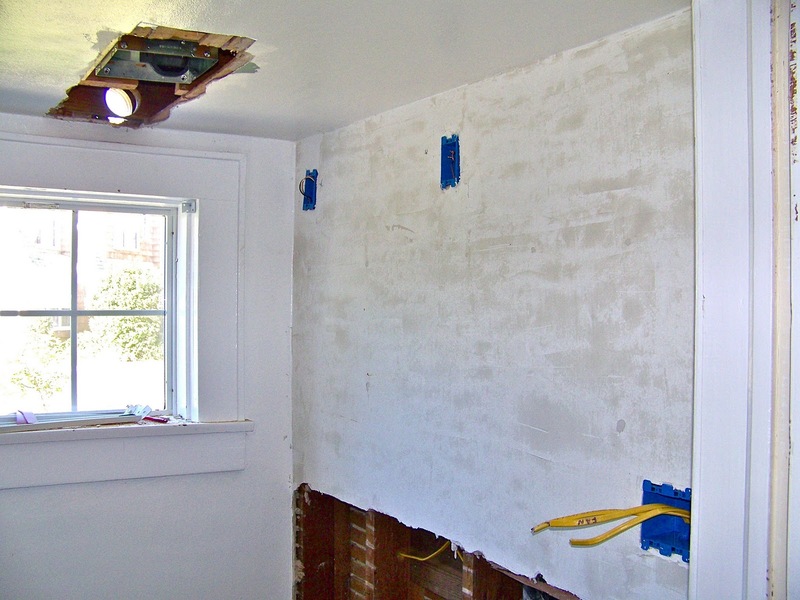 There was a hole in the ceiling for the fan, there was a much larger hole in the wall where we had replaced the plumbing and electrical, and the wires had been run to all the electrical devices. You'll notice that there are a lot of holes in the half wall that remains. This is because there used to be a lot of shelving on that wall. 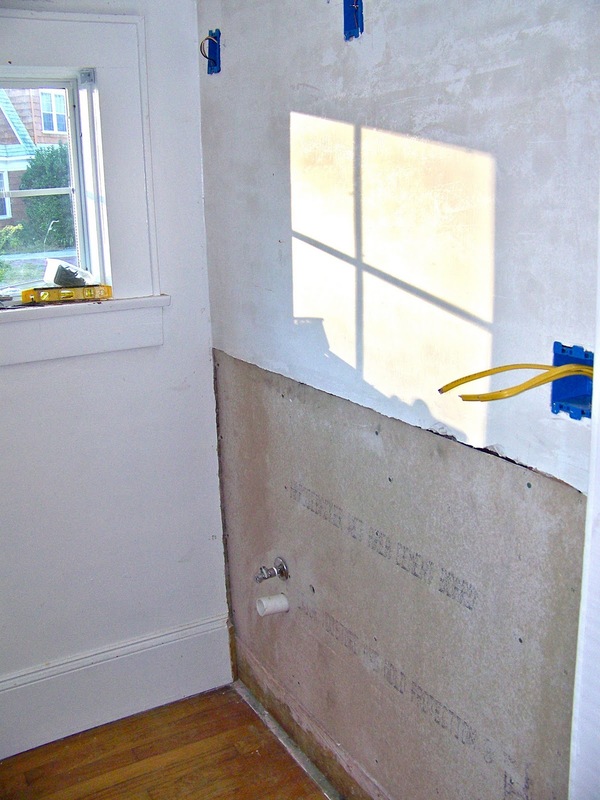 Obviously we didn't want all those holes so step 3 was to repair all the small dings and holes in the walls around the room. I only got pics of this one side, but I went around the hole room with joint compound filling in the little imperfections. This half wall had so many that I ended up doing a thin layer of compound over the whole wall to even it out. This can be a little tricky, but to get a nice smooth finish, you should get it as smooth as you can while it is wet and then once it is dry use either sand paper or a damp sponge to smooth out any left over imperfections. The next issue was that Nate apparently has super human strength. We kinda knew this when he broke a come-along trying to get this stump out at our last house (here my dad is getting the last little bit out) but it had been awhile so we had forgotten. So what happened was that when Nate was screwing in the turn off valve for the cold water side, he wanted to make sure that it was screwed in all the way so it wouldn't leak. He kept turning, and turning, and turning some more until all of the sudden there wasn't any more resistance.... which is not good. Nate actually sheared off a part of the copper supply line... this wasn't at a joint but in the main part of the pipe. I actually have no idea how he could have possible done it, but he did. 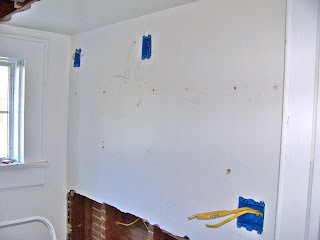 So once again the wall came down, everything was fixed (This time we waited to screw in the wall until the pipe was successfully attached) and the board went up for a final time. 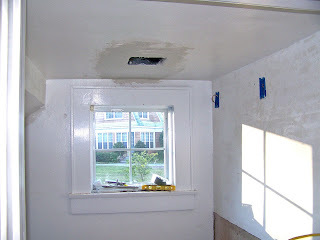 The last hole to be fixed was the hole in the ceiling that we made to put the ventilation fan in. 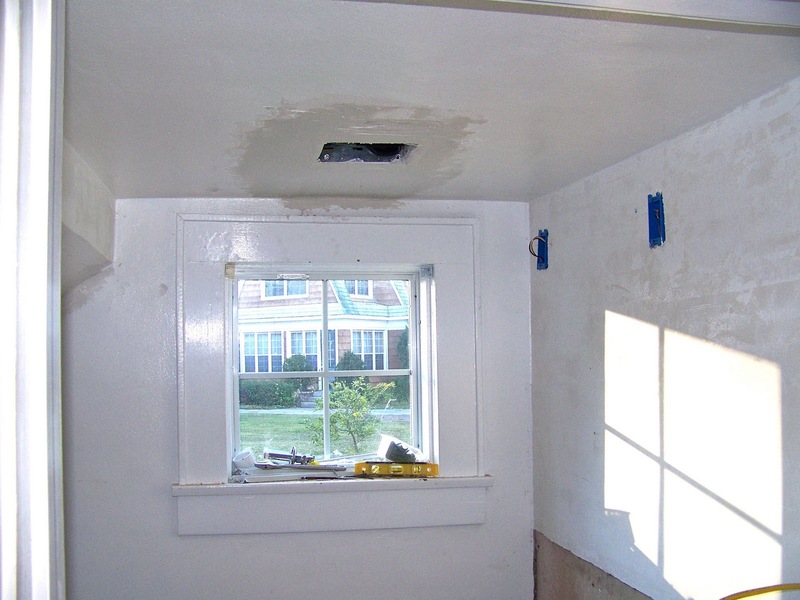 We first reinforced the ceiling (since this ceiling is the landing of our stairs) and then used small pieces of wall board to close off the larger holes around the fan. 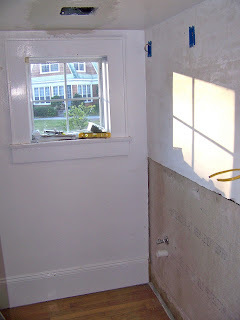 Then we used joint tape to cover the seams and pulled out our joint compound once again to fill in the seams. It took about 3 thinish layers of joint compound to get a nice even, smooth finish. So that is how we took the half-bath from holey to almost looking like a bathroom. Here is a shot with all of the holes fixed and ready for the next few steps!